Whether it’s your clients’ or your own sensitive information, keeping confidential information secure is essential. Holding on to documents you no longer need which aren’t kept in a secure area can pose a threat to your identity and can cause a data breach. Ready to do some spring cleaning? Sort important documents that you need to keep from ones you no longer need. Lock up the ones you decide to keep or scan them and store your digital files in a secure place. Once sorted, shredding physical documents you no longer need is the best way to ensure that they’re destroyed correctly. A data breach can put you and/or your organization at risk as well as tarnish your reputation. Here are ten reasons why shredding sensitive documents should be a top priority. Confidential waste, such as medical records, salary details or personal address details, legally have to be disposed of correctly under the Data Protection Act. These documents should be shredded before being thrown out to ensure people’s data remains confidential. Identity theft is becoming a common crime with criminals searching through rubbish bins to extract personal information about others. If someone got their hands on an individual’s address details for example they would find it much easier to apply for a credit card under their name. Manually ripping or cutting documents can take a long time, not to mention the threat of paper cuts! Shredding documents is a quick and easy way to dispose of papers which are no longer needed. Most companies are keen to highlight their green credentials and recycling paper is one way for companies to show their clients and competitors that they care about the environment. Shredding documents makes recycling much easier as the shredded paper can simply be bagged up and taken to a recycling point or collected by a recycling company. Businesses tend to document everything from meeting notes to staff details, future business developments to sales figures. Imagine if these got into the wrong hands? Shredding documents can give companies the peace of mind that people aren’t rifling through their waste paper to find out the future plans of a business. If a company has spent time and money researching a new product or service then this could be highly valuable to competitor companies. If a competitor got hold of confidential ideas or future product plans they could steal these and develop them themselves. This could result in a financial loss for the company who originally conducted the research. Some companies might have papers and documents which are many years old and no longer needed but they’re not sure how to properly dispose of them. Paper can take up lots of space in an office, sitting on desks or in filing cabinets, so by shredding these, space can be freed up. Having papers stacked around the office can create the perfect fuel to spread a fire. 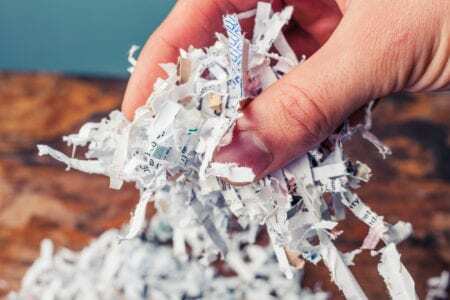 Shredding documents and then recycling them can ensure that companies only keep what’s necessary and remove the fire hazard that excess paper creates. If a company shreds confidential documents with details about their customers and clients then they can increase the trust these people have in the company. By shredding documents and making sure clients and customers know this happens, they can be confident that their data is being treated securely and with respect. Company bosses have access to and create confidential documents that directly affect their staff such as wage reviews, redundancy details, disciplinary information and salary scales. If an employee saw even a rough version of one of these documents about their salary or position in the company then this could cause suspicion and bad feeling to filter through the entire staff. Shredding potentially destructive information will ensure that companies don’t upset their employees unnecessarily.